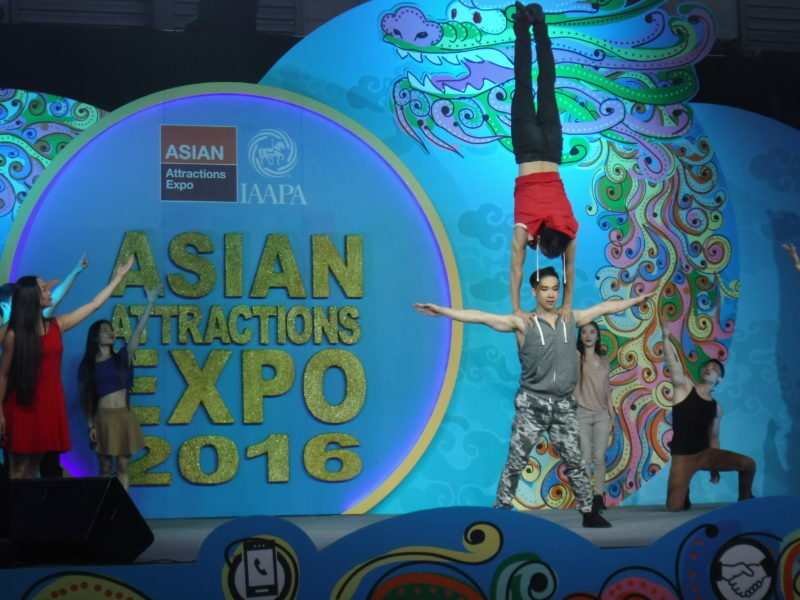 On the 14th of June, IAAPA CEO Paul Noland opened the 2016 Asian Attractions Expo with a moment of silence for the victims of the Orlando shooting that had happened a day prior. It was a somber and appropriate tribute – a necessary time of quiet in an event otherwise bustling with noise and activity. InPark Editor Martin Palicki was on hand for the expo, including the opening ceremonies, trade show, education sessions and special events. Many industry pros are saying Dubai Parks & Resorts’ Bollywood park will be the unexpected hit when it opens as part of the larger multi-park resort (scheduled to open in October 2016). Attractions, themed to Bollywood film IP, include multiple media-based rides, and highly themed shows (InPark’s Judith Rubin previewed Bollywood’s new stunt show and highlighted the park’s promising future in Issue #62, 2016). Holovis is providing an immersive tunnel attraction based on a car chase scene and helicopter ride around Dubai. Matt Dobbs, Holovis’ Project Manager, reports the ride will have two independent systems, each holding 30 people with back-to-back 3 DOF motion platforms. The film will be projected on a 6.2m tall curved screen. Triotech is installing one of their IDR (Interactive Dark Ride) attractions at the park. The dark ride experience is themed to the “Sholay” Bollywood film IP. Additionally, Wärtsilä FUNA is doing AV, projection and show control for over 80 venues at the Bollywood and Motiongate projects, as well as working with ITEC on show supervision for six attractions between the two parks. According to ProSlide’s Chelsea Ogilvie, the trend in waterpark attractions is mega-capacity. Driven largely by Asian waterparks that serve extremely large markets, slides need to accommodate a higher throughput. One solution ProSlide has available is using six-person rafts on slides previously using four-person rafts. Although not available for every attraction, most slides can accommodate the larger rafts without any engineering adjustments. Similarly, the company’s RocketBLAST™, which uses side mounted water jets to propel riders uphill, can handle two, three or four seat rafts with the same amount of water propulsion, making the ride flexible for different size parks. WhiteWater was promoting its LatiTube and WaveOz, both providing wave riding options, the former offering a kid-friendly honeycomb surface with nozzles that direct the water in an adjustable wave format while the latter can create up to 180-degrees of surfing for those looking for a tougher challenge. Polin showed off their Aquatube and Space Hole slides recently installed on the world’s largest cruise ship, Royal Caribbean’s “Harmony of the Seas.” As a side note, since AAE, Polin has reported that their team is thankfully safe following the recent unrest in Turkey. Many vendors brought a variety of VR experiences to the show floor with VR goggles dispatched to riding, reclining, siting and standing experiences. Watching attendees attempt to navigate virtual worlds highlighted that we are just at the beginning of learning how to best integrate, design for and use the technology. At best, many participants looked awkward, and those able to move around seemed to have to be re-oriented back into their designated virtual spaces with regularity. Iconpath founder Michael Reid is also cautious about VR’s application in a park setting. Despite critiques, VR is already enjoying a certain level of success at theme parks around the world, and the quantity of vendors committed to enhancing the product likely indicates that the tech will continue to proliferate in the market. Kraftwerk provides AV services, CAVU supplies the hardware and Falcon’s contributes design and project management. Magpuri also pointed out that the system’s software is able to extract the x-y-z positioning data from the film and automatically import it into the ride vehicle. Then the artist / programmer can go in and enhance the motion. The technology saves time and reduces rider sickness as the ride is already synched to the film. According to Magpuri, the partnership was driven by customers wanting turnkey solutions. Smaller parks often don’t have a way to manage vendors, and the partnership reduces the risk involved in that process. Design firm Rhetroactive and technology provider Holovis are partnering on a series of projects for Discovery Communications and are marketing their collaboration to other potential developers. “There are two approaches when designing a large project. You can pick attractions that will appeal to a certain audience or you can take our approach: We ask what is the story the client is trying to tell and what is the desired end result. Then we go and select the best ride systems available to fit that goal,” explains Rhetroactive’s Steve Trowbridge. The partnership has been developing for some time. The two companies have worked together on various projects and started discussing bringing skills together. Rhetroactive and Holovis are also working with vendors like JBA Artistic Engineering to provide infrastructure and engineering expertise to projects.